PageMutant Help - How do I make it look like my pages are hosted on my domain? How do I make it look like my pages are hosted on my domain? Make sure you have defined a CNAME in your PageMutant account settings. An example would be info.yourcompany.com. It just has to have a subdomain that is unique for your company's DNS settings. Go into your DNS settings or ask your IT team to do this for you. It should only take a couple of minutes. Set up a CNAME record that points to pages.pagemutant.com. All of your pages will look like they are hosted on this CNAME. Enter your CNAME on your PageMutant account settings. 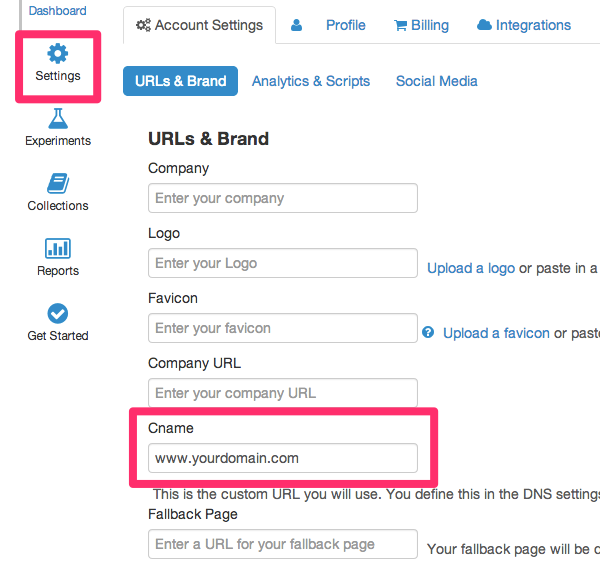 Learn how to choose a URL for your experiment.